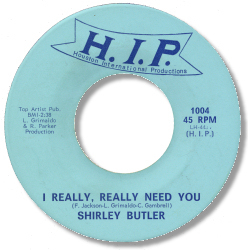 A Houston singers who sadly never made it out of her home state, Shirley Butler on her few recordings showed a clear delivery, and a fine sense of dynamics. She must have been good value in the clubs. She cut for the usual local suspects including Huey Meaux and Charlie Booth without making much of an impact – but all the 45s I know about (and there may well be others yet to be discovered) make good listening. Aurally they are all from the late 60s, although exact dates are impossible to ascertain. “I Can’t Get You Off My Mind” maybe a little too “supperclub” for some tastes, but the other Lu Juan 45 is a fine double sided effort. “I Fall To Pieces” is a fine jaunty upbeat number featuring a strong Farfisa organ (Augie Meyers? 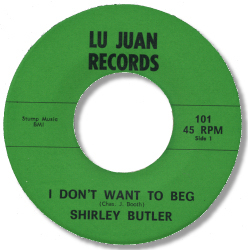 ), and I Don’t Want To Beg is one of those minor keyed blues ballads I always fall for. A great deep side. It’s Your Woman is her best vocal I think, as she really cuts loos over a powerfully arranged southern soul backing track. I Really Really Need You on HIP (not the Stax subsidiary label) is another tasty ballad. If you like Gloria Edwards you’ll love Shirley as well.